We combine sophisticated service with a comfortable yet urban sensibility. The 140-room resort features stylish rooms, as well as one and two bedroom suites, all with state of the art technologies. 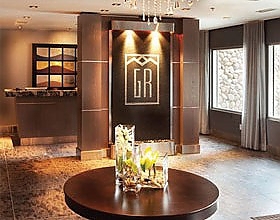 Fun at the Grande Rockies Resort is only an elevator ride away. 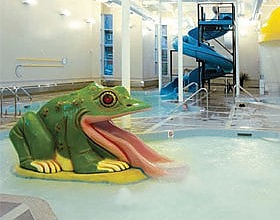 Resort style amenities include a spacious indoor pool with 3-story water slide, children’s activity centre, an indoor–outdoor hot tub and fitness facilities. Each one and two bedroom suite includes includes designer décor, ecofriendly amenities, full kitchen, spa-inspired bathroom, deck with BBQ, flat screen LCD TV with Blu-Ray™ HD player, high-speed wireless internet access, natural gas fi replace, and in-suite washer and dryer. Boutique rooms consist of a variety of king and queen rooms, marble entrances and bathrooms, raindrop showers, fl at screen LCD TV, wireless internet, robes, arm chairs, desk, Frette linen. Luscious libations and exquisite cuisine – Habitat Restaurant and Bar offers sophisticated gourmet fare in a lively, relaxed atmosphere. Seating for up to 60 people; can be used for private events, and is the perfect setting for weddings, parties & meetings. Room service is available from 7:00 am – 11:00 pm daily. 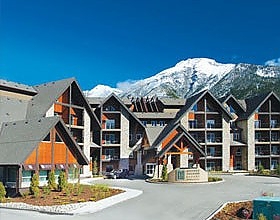 Grande Rockies features three brand new state of the art meeting rooms with windows overlooking the Canadian Rockies. All rooms contain internet access, black out drapes, and full AV capabilities. The rooms accommodate from 4 – 100 people. A private room is available on-site with services offered by a local spa.